When Dell launched its Inspiron Gaming PCs last year, it seemed like a no-brainer. Instead of leaning heavily on flashy lights or the wild cases you see on Alienware systems, Dell’s lineup of affordable gaming laptops and desktops, all with starting prices well under $1,000, were focused simply on delivering high quality graphics at full HD without needing to spend a ton of money. 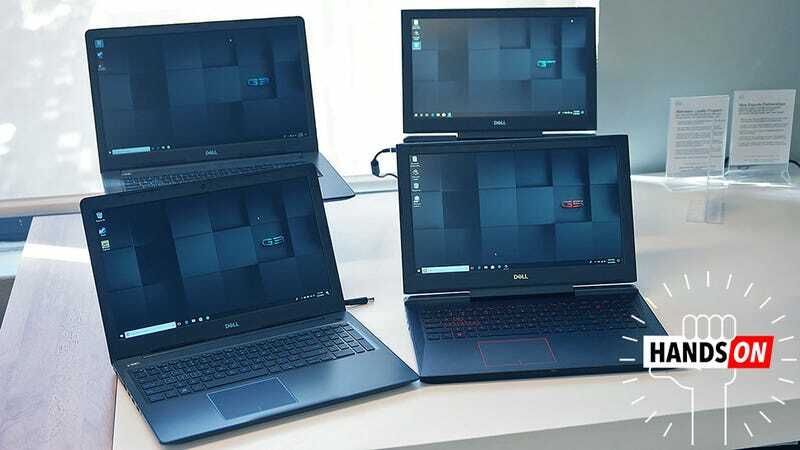 However, one thing that never really seemed to fit was the Inspiron tag, which has largely been the home for uninspiring mainstream PCs aimed at students and small business as opposed to anything gaming related. That’s why, in addition to adding new models and configurations to family, Dell gave its low-cost gaming line a new name: the G-Series. Available in 15 and 17-inch sizes, the G-Series family will come in three different tiers: the base G3, the mid-range G5, and the high-end G7. Of course, the G3 is the cheapest of the bunch, starting at $750 for a 15-inch version, or $800 for the 17-inch model. It can be upgraded with extras like up to 16GB of RAM, new 8th-gen Intel CPUs, and Nvidia 1060 Max-Q GPUs. Dell didn’t have any of the white G-Series laptops to show at its event. Sorry. Keeping “legacy” ports like Ethernet and the SD card slot is a nice, especially on lower-priced systems. G-Series keyboards are back lit, but you only get one color. Including HDMI and USB-C is a nice bonus too. Stepping up, the G5 starts at $850 and is only available in a 15-inch body. You can upgrade it to a six-core Intel i7 chip and dual SSDs, while the 15-inch G7 (also starting at $850) goes all the way up to an overclockable Intel Cote i9 CPU and a 3840 x 2160 UHD display. On the outside, these systems are pretty plain, but in my short time with them, they did feel quite solid. Unlike Dell’s other gaming brand Alienware, there’s no configurable RGB lighting built into the cases and keyboard of G-Series systems. Instead you’ll get a choice of red, white, or blue accents colors, so you better be sure you really like that color before you buy. Dell says it wanted to spend less time worrying about looks, and more effort providing useful gaming features like matte anti-glare displays and new front air intakes, which should help reduce fan noise and prevent thermal issues from impacting graphics performance. That said, Dell claims that at 0.89-inches thick the 15-inch G3 is actually the thinnest gaming laptop the company has ever made. In addition to updated guts, Alienware and XPS systems are also getting optional black brushed aluminum lids. Aside from the new G-Series laptops, Dell also announced a few improvements to its other PC lines including updated 8th-gen Intel CPUs on Alienware laptops and the XPS 15, with the latter also getting a slight graphics boost thanks to a new optional Nvidia 1050 Ti GPU. All of these revamped and rebranded laptops will be available later this spring in mid-April, with certain models like the 15-inch G5 going on sale today.